Why is silage density important when packing bunkers and piles? Attaining a high silage density is important for two primary reasons. Most importantly, density and dry matter content determine the porosity of the silage. Porosity, in turn, sets the rate at which air moves into the silo and subsequently the amount of spoilage which occurs during storage an feedout. Ruppel (1992) measured dry matter loss for alfalfa silage and developed an equation to relate the loss to density. Table 1 summarizes those results. The higher the density, the greater is the capacity of the silo. Thus, higher densities generally reduce the annual cost of storage per ton of crop by both increasing the amount of crop entering the silo and reducing crop losses during storage. So, what is porosity and why is it important? Porosity is a measure of the voids between the solid particles of a material. Pore space can be filled with fluids including gas and/or water in silage. The “gas filled” porosity allows gases to move within the material. For gases to move throughout the material, the pores must be continuous. Closed pores do not contribute to gas flow. The preferred gas in stored silage is carbon dioxide. In high concentration, it displaces oxygen which contributes to aerobic microbial activity. Aerobic microbial activity decomposes available carbohydrates with resultant dry matter loss. Evidence that aerobic activity is occurring is heating silage. Evidence that aerobic activity has occurred for some time is increased fiber and crude protein contents and in extreme cases moldy gray to black colored silage. How does gas flow through porous silage? There are several forces which can cause gas to move through the pores of silage. The first is diffusion through the exterior surfaces. For example, at the feed out face, the oxygen content of the air is about 20% and deep in the silage mass it is 0%. Thus oxygen moves from high concentration to low by diffusion through the open pores. This process occurs in all feed out faces independent of orientation (vertical or horizontal). The higher the porosity, the faster the oxygen flow rate. This process also occurs at the top, sides or walls. The lower the porosity of the wall or cover, the lower the oxygen diffusion rate. Gravity can move fluids through porous materials. A common example of this is water moving through the soil profile. A similar process occurs with gases. Carbon dioxide, which is heavier than air, settles through silage and emerges from the bottom of the vertical feed out face of a horizontal silo. The carbon dioxide is replaced by air drawn into the top portion of the feed out face. This air containing oxygen supports the spoilage organisms. They release carbon dioxide as they decompose the carbohydrates and the cycle continues. Finally wind impacting the silage surface can result in gases being displaced by oxygen bearing air. Walls and roofs of tower silos help protect the feed out face from wind. Walls of bunker silo provide some wind protection. Porosity is difficult to measure in the laboratory and probably impossible to measure in the field. An equation developed by Richard et al (2004) relates porosity to bulk density (as fed density) of organic materials. This equation was used to develop Figure 1. 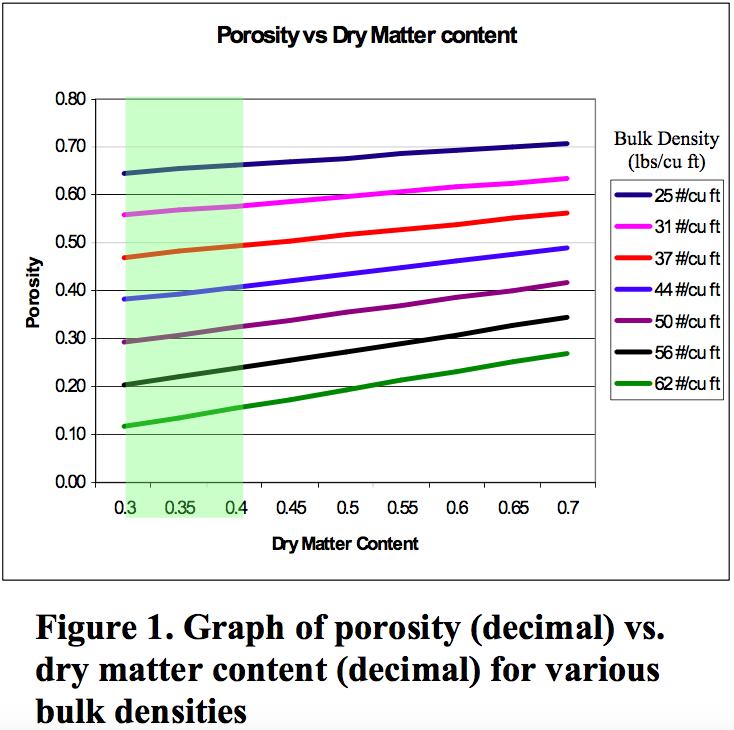 From this graph, porosity is most influenced by bulk density over the range of dry matter contents recommended (0.30-0.40) for ensiling in bunkers, bags and piles. 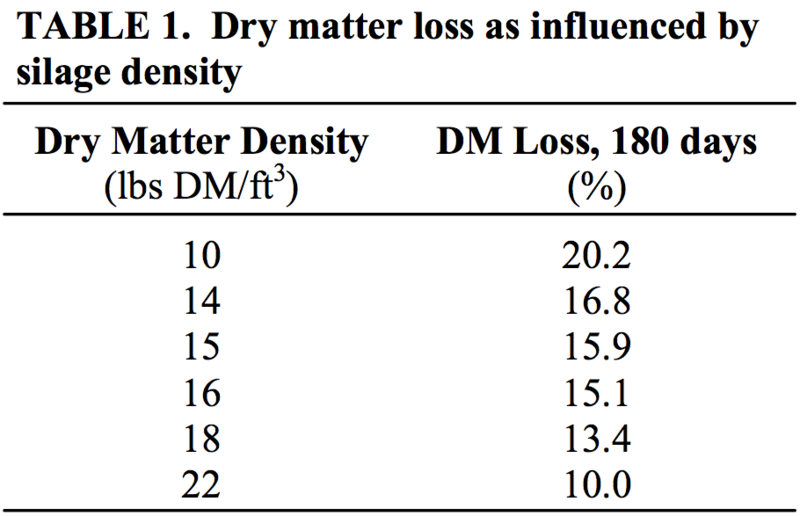 Holmes and Muck (2004) have recommended a minimum dry matter density of 15 lbs DM/ft3 as a reasonably attainable density and to avoid excessive dry matter loss. 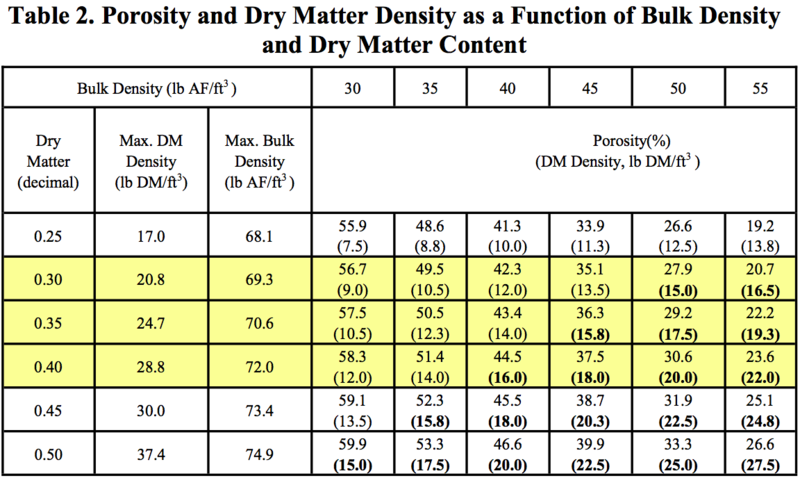 From Table 2 it is apparent the porosity varies quite widely (~20-60%) for the combinations of dry matter content and bulk density that produce a dry matter density of 15 lbs DM/ft3 (note bold values for DM density meet or exceed 15 lbs DM/ft3). That being the case, it may be better to recommend a maximum porosity in the range of 30-40%. However, because porosity is relatively constant for a given bulk density over a typical range of ensiling DM contents and because bulk density is more readily measured than porosity, it may be better to recommend a minimum bulk density. A minimum bulk density of 44 lbs AF/ft3 keeps porosity below 40% within the recommended range of DM content. An example may be useful here. If one wants to achieve a bulk density of 50 lbs AF/ft3, what dry matter density must be achieved? From Table 2, forage at 30% dry matter can be packed to 15 lbs DM/ft3 to give the desired bulk density, but dryer material at say 40% dry matter must be packed to 20 lbs DM/ft3 a much more difficult task. In both cases, the porosity is close to 30%. What is the minimum recommended density when packing bunker or pile silos? To keep porosity below 40%, a minimum bulk density of 44 AF/ft3 is needed (see Figure 1). Holmes, B. J. and R. E. Muck. 2004. Managing and designing bunker and trench silos (AED-43). MidWest Plan Service. Ames, IA. Ruppel, K.A. 1992. Effect of bunker silo management on hay crop nutrient management. M.S. Thesis, Cornell University, Ithaca, NY.